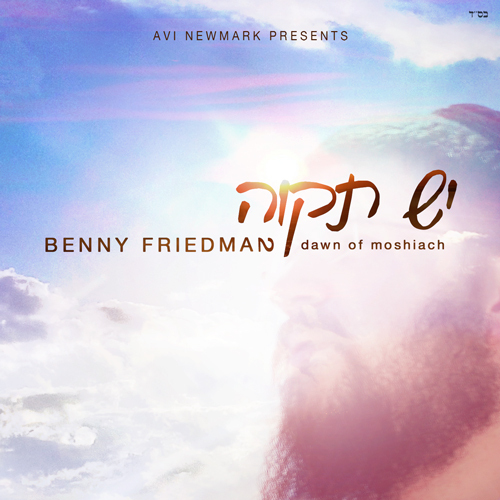 Almost three years after Jewish music lovers everywhere first got a taste of Benny Friedman with his debut album, Taamu, the talented singer is set to release his newest collection of musical gems, much to the delight of his loyal legions of fans worldwide. Titled Yesh Tikvah, the album promises to be yet another powerhouse from the duo of Benny Friedman and Avi Newmark, who have teamed up once again with engineer/arranger Ian Freitor and technical producer Sruly Meyer for an eleven song release that strives for an unsurpassed level of musical excellence. Having set the musical bar so high with Taamu, Friedman acknowledges that the pressure was on for Yesh Tikvah, which features an array of songs that cover a full range of emotions and musical genres. Both Friedman, who has been cementing his status as a musical superstar one performance at a time, and Newmark, who has earned a reputation as a producer par excellence with a track record of producing albums that are cutting edge, innovative, yet never cross the line, have high hopes for Yesh Tikvah, a labor of love for both artists that has spanned close to three years. Yesh Tikvah features compositions by Elimelech Blumstein, Ari Goldwag, Bentzi Marcus, Yitzy Waldner, Marc Levine and a joint composition by Yoni Eliav and Friedman himself. Rounding out the roster of talent are arrangers Ian Freitor, Leib Yaakov Rigler, Yaron Gershovsky, Aryeh Kunstler, choir work by Moshe Roth and background vocals by Yitzy Spinner and Ari Goldwag.